Priyanka Chopra Jonas has huge fan followers across the globe. The actress who has worked in Bollywood and Hollywood, has made everyone proud with her achievements. She still continues to surprise everyone with her choice of projects. The 2019 Women in the World is going on at the at New York City’s Lincoln Center. It is an annual gathering for which women leaders from various fields are invited to share their stories in order to create certain solutions for the ongoing issues in the world. This is the 10th annual summit which started on April 10 and would be concluded today (April 12). For this year’s summit, Priyanka Chopra Jonas was featured amongst the notables. 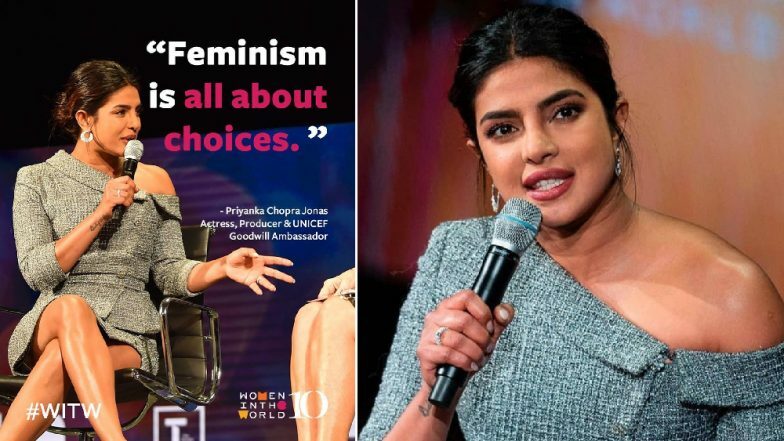 It is during her interaction with the founder of Women in the World, Tina Brown, when Priyanka shared about her career as an activist and entrepreneur. She also opened up about feminism and stated it is all about choices. Priyanka Chopra and Nick Jonas Join The Met Gala Committee and Bring Their Love Story to Full Circle - Here's How. Priyanka Chopra Jonas who is an actress, a producer and UNICEF Goodwill Ambassador has always been vocal about women-centric issues. She also emphasized that, “ideas are the currency of the present”. She also mentioned, “Allow your brain to have ideas. Think about how you can make those ideas real, because this is the time when we can do it. Never before in history of mankind have we been able to sit in our homes, have an idea and maybe create into an app and monetize it. You can do anything, anywhere. It’s just that people hold themselves back, thinking that, ‘Oh I don’t know if I could even attempt this because I don’t have connections’. You can make the connections, it’s all in the mindset that has to be updated a little bit.” JSisters Priyanka Chopra Jonas, Sophie Turner, Danielle Jonas Give Us a Perfect Start to the Weekend With This ‘Cool’ Pic. Priyanka Chopra Jonas who was proud about being a part of this summit shared a picture on Instagram and captioned, “So proud to share the stage with the incredible women who took the stage before me and after me at @womenintheworld. Your game changing work is shaping the world and moving the much needed needle for women. I applaud you and feel proud to have had the opportunity to share this platform with all of you. #TinaBrown, Thank you for having me. #WITW”. The other personalities who were also part of the 2019 Women in the World summit included Jill Soloway, Ashley Judd, Oprah Winfrey, Brie Larson, Dr. Mae Jemison, Gulchehra Hoja, Cameron Esposito, and many others.